From left, are Dan McShea, assistant professor; Larry Flatt, executive director of advanced robotics; Dr. Michael Torrence, Motlow president; Dr. David Bethea, assistant professor; Pamela Harris, assistant professor; and Dr. Khalid Tantawi, assistant professor. Not pictured is Paul Sand, assistant professor. 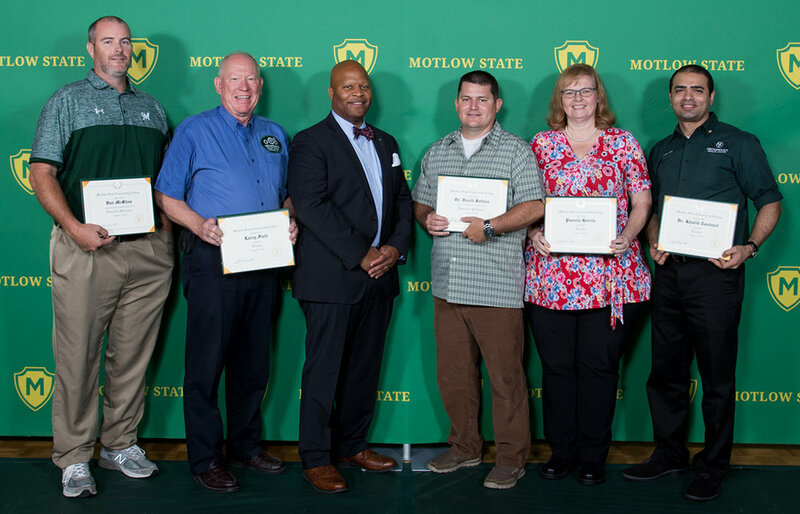 Six members of the Motlow State Community College faculty recently received recognition at the College’s Fall Convocation for being granted tenure by the Tennessee Board of Regents. In higher education, tenure is a faculty member’s permanent job contract. The award of tenure is recognition of the merit of a faculty member and of the assumption that he/she would meet the long-term staffing needs of the department or academic program unit and the college.